A new tweak Go Native, has been released. This is a free tweak which will allow you to run applications in the background natively, on the applications that don’t support it yet. The developer said that this is an alternative to the tweak Backgrounder, in case you want native iOS 4 multitasking for all applications. One important thing to note is that this tweak only supports iOS devices that support native multitasking. So devices like the iPhone 3G are not supported. This tweak does not add any additional icons to your springboard, but it’s configurable through the Setting application on your iOS device. 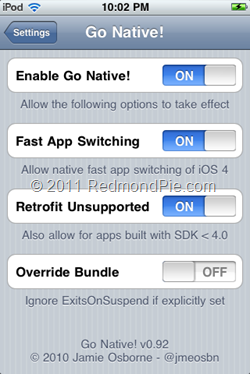 Go Native is available from Cydia under BigBoss repository for free.